The basic idea behind diffusion is simple and intuitive. Our problems arise because we end up with a bit of calculus, which many of us don't find easy to interpret. Here we show that the equations aren't so hard and that a calculus-free equation can already give us some helpful insights from simple diffusion data. Knowing the thickness, L, of a sample, the saturated concentration, c, of a solvent in the polymer (not the solubility of the polymer in solvent! ), and some rough idea of a Diffusion Coefficient, D,(we'll see where we can find some values), we can say how much stuff (flux, F) will flow through the polymer, and the time, t½, needed to reach half that flux. Or, more usefully, if you know L and can plot F as a function of time, by sliding D till you get the correct t½ you've found your diffusion coefficient! Although these two laws are simple, they are differential equations (for example, the concentration gradient changes with the flux which depends on the concentration gradient) and the solutions in most real cases (where D also depends on concentration) are not straightforward. Therefore numerical simulations are required to capture what really happens. Fortunately on this page we can explore some cases which happen to be very relevant in practical terms. Once we're happy with the basics we can then look at more general cases, with the app doing all the hard work of carrying out the numerical simulations. The real problem is not the formula, but getting inputs and outputs in the right units. D is usually expressed in terms of cm²/s and has values of 10-5 for self diffusion in liquids, thru 10-7 for diffusion through rubbery polymers up to 10-12 for typical polymers and 10-15 for very close-packed polymers. If you have a D value in m²/s divide it by 104. Concentrations are best expressed in terms of g/cm³. Thicknesses are typically in µm but have to be converted to cm for the calculation. 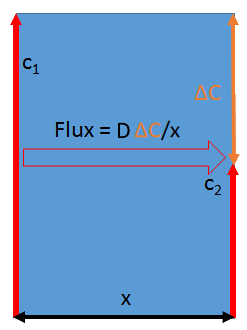 Fluxes are, therefore, in g/cm²/s. A complication is that it's often easier to think of solubility in terms of volume fraction. Assuming, for simplicity, that all densities are 1g/cc, a volume fraction of 1 equals a concentration of 1g/cc. This is convenient. It is intuitive to think of a polymer containing a 0.1 fraction of a solvent (i.e. 10%) and this simply becomes 0.1g/cc for the calculations. Adjusting for relative densities is a trivial task.